Two stunners with regional ties, Gigi Hadid and Imaan Hamam, joined other famous models for the brand’s first Pre-Fall show. 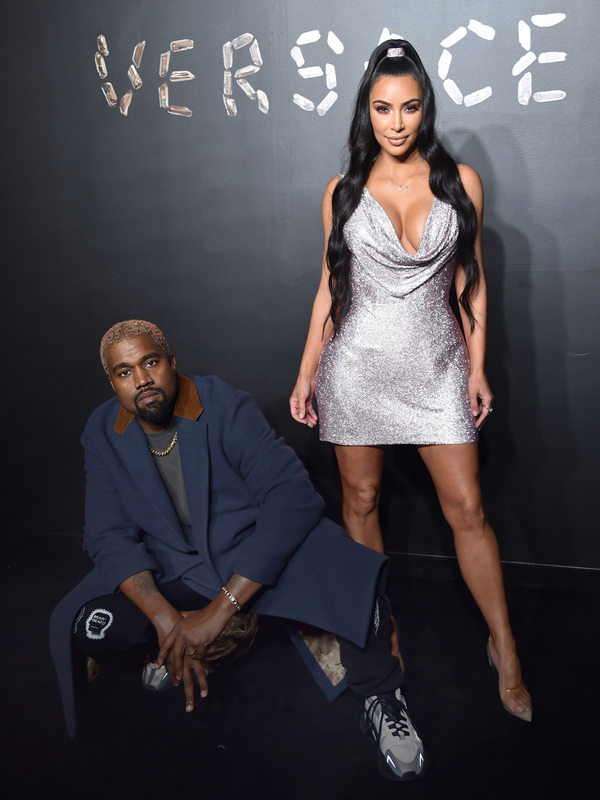 In addition to being Versace’s first-ever Pre-Fall show, this was the first time the Italian luxury brand took over New York City. To make it even more special, the stupendous show took place on December 2, on what would have been founder Gianni Versace’s 72nd birthday. This all made it entirely fitting for Donatella Versace to fill the catwalk and front row with celebrities. With the centre of the New York Stock Exchange as a background, models of the moment like Kaia Gerber, Gigi Haddid and Hailey Baldwin Bieber all helped make the show for the Pre-fall 2019 collection extra special. While the recently married Hailey wore a black and white mini dress featuring a patch and striped pattern with long sleeves, Gigi rocked a white T-shirt with the brand's logo on the front with a satin black, yellow and white wrap hi-low skirt. The young Kaia, who opened the show, sashayed down in a furry crop top, PVC style brown leather jacket and a midi-length camel coloured satin skirt with a slit. Russian Irina Shayk and Emily Ratajkowski also graced the catwalk. The latter showed off a black leather top featuring a one-shoulder design with a keyhole cut-out and a matching mini skirt. Imaan Hammam, the gorgeous model with Egyptian and Moroccan roots, was another stunner who took a turn around the replica of Lady Liberty’s torch, which stood in the house’s signature gold. During a press conference before the show, Donatella said that as well as being a symbol of New York, the Statue of Liberty is a “symbol of women, of empowerment and strength.” And her models certainly looked fierce after the designer turned to the archives for inspiration. This included the famed spring 1994 collection that produced Elizabeth Hurley’s famous safety pin dress by Gianni. Vittoria Ceretti looked sensational in her asymmetrically fastened number, with lots of gold lining the slits. Another major revisit was a dress created by Donatella herself; the one that helped Jennifer Lopez make red carpet dressing history at the 43rd Annual Grammy Awards. Versace muse Amber Valletta appeared in a similar revealing plunge-neck frock, which came in red, pink and orange rather than the original green and blue. Another apparent touch up was replacing palm prints with Jim Dine hearts. 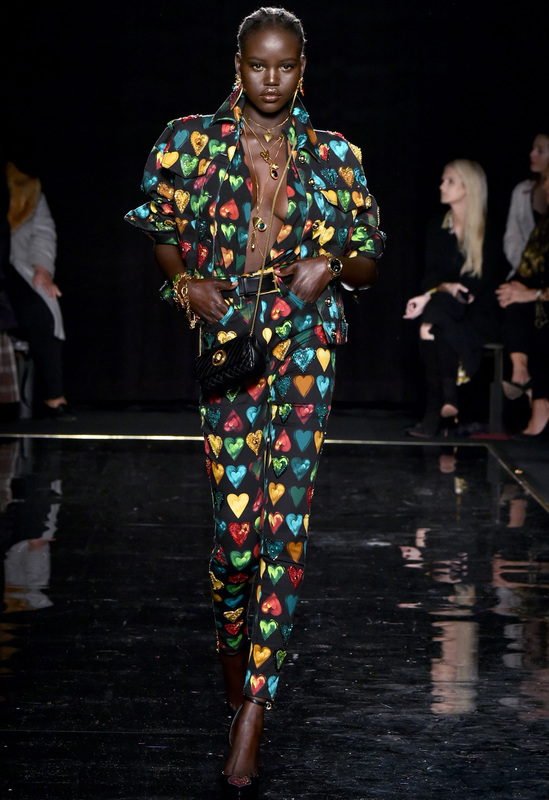 The Dine hearts, which are inspired by the family’s own art collection and featured in spring 1997, were also spotted on Adut Akech’s denim look. 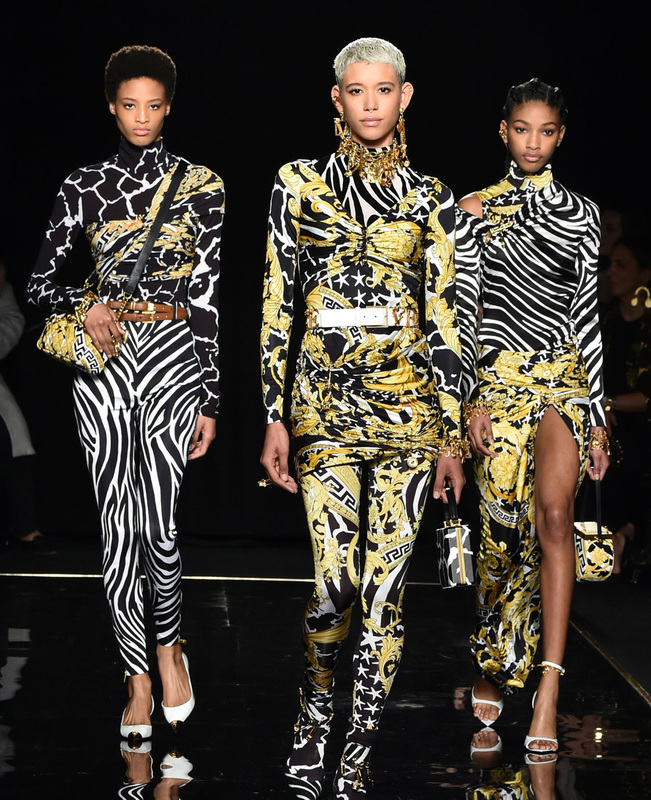 Other familiar Versace motifs, like the medusa print, were also out in full force. Certamente, the brand’s most recognisable friends all flocked downtown to see the collection, which can be pre-ordered from December 8. 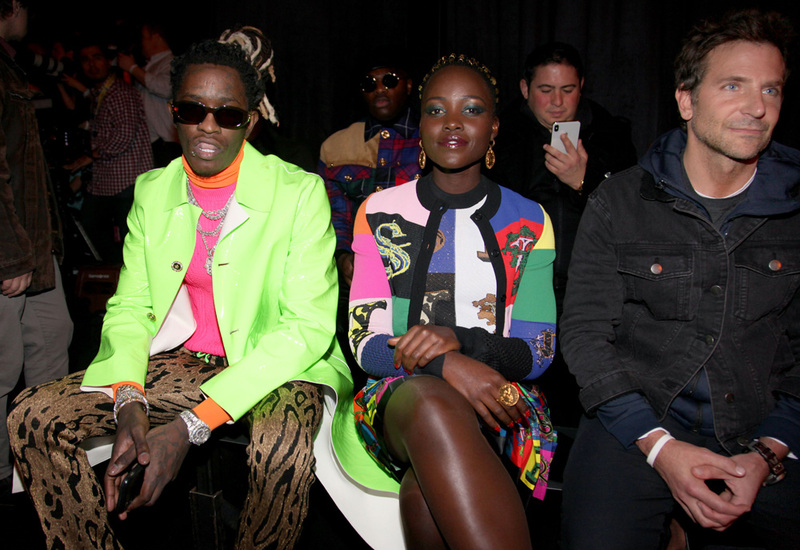 Winnie Harlow, Blake Lively, Kim Kardashian West, Kanye West and Bradley Cooper, there to support wife Irina, were some of the celebrities spotted in the star-studded front row, which also included big names in the music industry like Young Thug and 2 Chainz. Lupita Nyong’o, Uma Thurman, Diane Kruger and Mary J. Blige were there too to see the collection from the brand, which was recently acquired by Michael Kors for a staggering $2.12 billion.